0:00 To start a new Scripted Recording you click the "Scripted" button shown here. 0:04 First you should give you script a name by clicking at the top and entering a name. 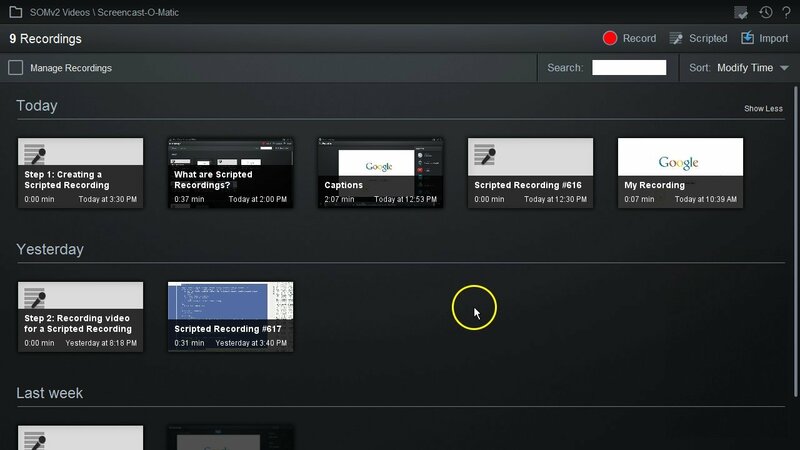 0:09 For this example we'll create a very short tutorial on how to do a search at google.com	0:14 The script will contain multiple sections which you record audio for one at a time. 0:20 You'll need to break up your script into sections that take into account spots that may take some unknown amount of time. 0:28 For example in our tutorial our first action is to type in a query and click the search button. 0:34 We make this it's own section because the time it takes us to type and wait for the search results will vary so this way if our scripted audio ends before the results show the screen recorder will add silence to the end of this section until we move on to the next section. 0:51 Now we'll add one more section which we can do just by hitting the enter key or clicking the "Add Section" button. 0:58 You can re-arrange sections by clicking the section number box at the left and typing in a new number for that section. 1:06 Once you're ready to record the audio you should click the top section to select it. 1:10 Next you would make sure the correct microphone is selected. 1:17 And when you're ready to go click the Record button. 1:21 The first section you have selected will turn red then become green when you should start talking. 1:26 Once you've read the text in the section you can click the Next button (or press the right arrow key) to go to the next section or you can click Redo (or the delete key) if you need to redo the audio. 1:40 After recording audio you'll see the duration of each section listed on the right. 1:46 You can click that to see options for that section which at this point is to remove the audio for that section or delete it. 1:53 You can playback the audio using the controls at the bottom. 1:57 And you can undo, redo or go back in your edit history using the controls at the top. 2:04 Anytime you modify the script text or audio the changes are auto saved. 2:09 Sometimes you might create multiple sections to break up the audio recording so its easier to record. 2:15 If you do that but you'd like to record the screen as one section then you can combine sections before recording the video. 2:22 For example if we wanted to combine these two sections then we would click at the start of the text in the second section and then click the Backspace key which will show us this prompt to confirm and then combine the text and audio from both sections into one section. 2:39 If you do this however you can not uncombine sections by pressing enter key, but we can undo the combine if we need by pressing the undo button. 2:49 After you've got the audio ready to go you can move on to record the video which we cover in the next tutorial.